The program listed below is archived at cctaxpayers.com. Sunday at 11 am and 8 pm, Wake-up Call is broadcast on WTKF 107.1. This week’sl broadcast will feature a discussion with Major David Goetze (Ret.). Major Dave served in the Military Police of the U.S. Army as an investigator dealing with computer data. 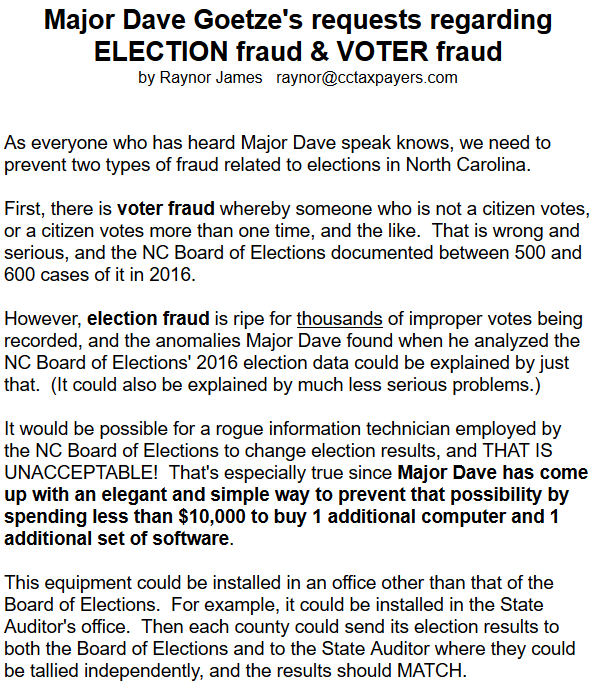 Major Dave has closely examined the public records of the 2016 and 2018 elections in North Carolina and found some very interesting anomalies. He will be discussing his findings on Wake-up Call this Sunday. I can promise you that the show will be eye-opening. Voter identification is one of many ways to prevent voter fraud. For whatever reason, it seems that one particular political party seems to oppose voter identification even after evidence of voter fraud–non-citizens voting, dead people voting, hundreds of people claiming to live in a parking lot registering to vote, etc. In November, North Carolina will have a referendum on the ballot allowing voters to approve or disapprove of voter identification. Civitas Institute, a North Carolina based group, posted an article last week showcasing international voter identification laws. However, many countries hailed as more voter-friendly than the United States have voter ID laws in place. Norway mandates that voters present a photo ID, including a “passport, driving license, or bank card that includes a photo,” to vote. Voters in Northern Ireland must present an “acceptable photo identification” to cast an in-person ballot. Germany requires that voters bring a state-issued voter identification card, but they can substitute another form of ID for that card if they fail to deliver it at the polls. Ballots in Switzerland are issued by mail, and voters who return their ballots in person are required to show an ID and a state-issued polling card to do so. France requires a voter ID. Israel requires a voter ID. Mexico requires a voter ID. Iceland requires a voter ID. It seems like common sense to want to know who is voting. Civitas has already pointed out that North Carolina’s constitutional amendment would bring the state into the mainstream within the country since 34 other states already require voter ID in some form. Voter identification is innocuous among a majority of US states and various countries across the world. There is no reason to believe North Carolina would be the exception. Collins claimed that the United States makes voting more difficult for its citizens than its peer countries and implied that voter ID requirements compound that disparity. Since many Western democracies also implement voter ID requirements, we rate this claim as false. I will vote to support the implementation of voter identification. It is understood that the state will provide identification cards free for anyone who needs them. Most residents would be willing to drive anyone who needs transportation to wherever they need to go to obtain a voter identification card. Works for me. That is the law. Judges are supposed to uphold the law. However, that does not always seem to be the case. Last Monday The New York Times posted an article about a ruling by U.S. District Judge Julie Robinson. The ruling by U.S. District Judge Julie Robinson is the latest setback for Kansas Secretary of State Kris Kobach, who has championed such laws and led President Donald Trump’s now-defunct voter fraud commission. The 118-page decision came in two consolidated cases challenging a Kansas voter registration law requiring people to provide documents such as a birth certificate, U.S. passport or naturalization papers. “There is nothing controversial about requiring United States citizens to show identification when they register to vote; it protects American citizen’s right to free and fair elections. Instead of mocking or playing politics with the integrity of our electoral process — the judiciary should be protecting it,” Watkins said. I have a question. If the law says non-citizens cannot vote in national elections, doesn’t it make sense to ask people who are registering to vote to prove they are citizens? This is another really bad example of a judge making a ruling that goes against established law. When this occurs, judges who do this need to be impeached and removed from the bench. For years we have been hearing the Center for American Progress say that voter ID laws are equal to voter suppression. The charge is somewhat ridiculous when you consider that the vast majority of Americans have picture ID of some sort because it is needed for so many simple things–cashing a check, entering a federal building, boarding an airplane, buying alcohol or cigarettes, opening a bank account, etc. Nevertheless, the Center for American Progress and other leftist groups claim that voter ID is voter suppression–they never mention that states that require voter ID also provide free ID cards for anyone who needs them. Well, the motives of the Center for American Progress are showing. The Washington Times posted an article today about the Center for American Progress’s efforts to make our elections more secure. After years of accusing states of “voter suppression,” the Center for American Progress wants to make it tougher for overseas military to vote in the name of election security. The left-wing public-policy group issued Monday a report, “Election Security in All 50 States,” that called for stricter standards to prevent cyber-meddling in elections by foreign governments, including banning military stationed abroad from submitting ballots via email or fax. “They don’t believe someone who works on a submarine should be allowed to vote. We do,” said the Republican Williams in a statement. “You can bet that if the military historically voted Democrat instead of Republican, the Center for American Progress would not have a problem with it,” added Peak in a Monday post. The report comes as something of a departure for the center, given its record of fighting for greater ballot access, including same-day registration and making it easier for felons to vote, and against tighter rules aimed at combating voter fraud. Founded by former Clinton and Obama White House adviser John Podesta, who currently sits on its board, the center has opposed state efforts to require government-issued photo identification, scale back early-voting periods, and remove inactive voters from rolls. The hypocrisy shown by the Center for American Progress is amazing. Breitbart posted an article today about a recent study of voter fraud in America. Government Accountability Institute (GAI) President Peter Schweizer, also a Breitbart News senior editor-at-large, discussed a new report on Tuesday’s Breitbart News Daily. The report documents 8,400 cases of double voting in the 2016 election. “We took an extremely conservative metric, and we hired a data company and said, “Let’s look at who actually voted in 2016, and can we find people that had the same first name, middle name, last name, date of birth, and the data company has access to partial Social Security numbers?” Schweizer said of the GAI’s methodology. “Can we find examples of people who double voted, just using that metric? Because if all those things line up, the data company tells you it’s basically 100 percent it’s the same person,” he said. “We were able to get data from 20 states, and we found 8,400 examples where those metrics matched,” Schweizer revealed. Keep in mind that this number is strictly double registrations. We have no idea how many non-citizens voted in the last election. Actually, even voter id would not have prevented this voter fraud. Voter id targets people who are not legally entitled to vote or people voting using other people’s names. Our biggest problem in the last election was not Russian interference–it was misguided Americans committing voter fraud. The Daily Signal posted an article today about voter fraud. This revamped edition of the database separates cases by type of disposition, allowing readers to easily distinguish not only what type of fraud occurred but the outcome of the case—criminal convictions, pre-trial diversion programs, and other types of adjudication used in various states and counties across the United States. The article reports specific incidents in a few states. Elections, even federal elections, are controlled by the individual states. However, it is time for all the states to take action to limit voter fraud. One way to limit voter fraud would be to institute voter identification. That would be a really good place to start. Yesterday The Daily Signal noted that the presidential commission to examine voter fraud began its work. The goal of the commission is to examine voter fraud and the soundness of the election process throughout the country. Every vote cast illegally cancels the vote of a legal voter. It is time we investigated and put an end to voter fraud. The Washington Free Beacon posted an article today about a group of liberal professors who want to counter the efforts of President Trump’s voter fraud commission. Why? I would think all Americans would be in favor of making sure our elections are honest. Any fraudulent vote cast nullifies a legitimate vote. Why would anyone support voter fraud? A leaked email obtained by the Washington Free Beacon shows a proposal floated by members of the a prominent left-wing professor’s email listserv to form an academic commission to counter President Trump’s voter fraud commission. Shortly after the announcement, Rutgers University Professor Lorraine Minnite emailed UC Irvine Law School Chancellor Rick Hasen’s email listserv in an effort to enroll members to “resist” Trump’s commission, according to an email provided to the Free Beacon. So having to identify yourself and prove that you are a citizen of America to register is damaging to democracy?? First of all, we are a representative republic–not a democracy (you would think a professor would know that). Second of all, we are one of the few countries in the world where elections are held that does not require voter identification. It is time to realize that not everyone is honest and that we need honest elections. Most Americans have some form of identification. You need some sort of identification to buy cigarettes or liquor, board an airplane, cash a check, enter a government building, and attend many liberal political events. It seems very odd to me that someone would oppose having to show identification to vote, particularly when most states offer free voter identification cards. Actually, I think it is very nice that the Democratic Party is giving these refugees welcome baskets with a welcoming letter. I suppose it is sweet to also give them voter registration forms before they are actually citizens who can vote. 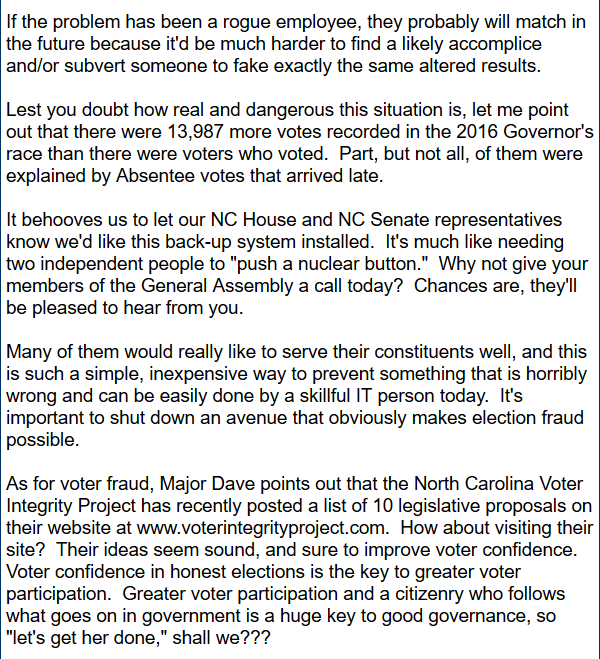 Nothing like encouraging voter fraud.